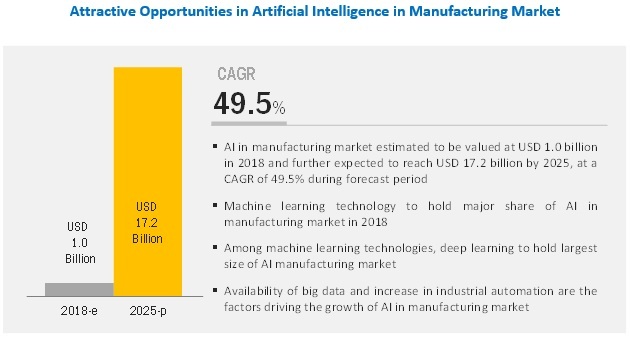 [184 Pages Report] The AI in manufacturing market is expected to grow from USD 1.0 billion in 2018 to USD 17.2 billion by 2025, at a CAGR of 49.5% during the forecast period. The huge availability of big data and increase in venture captital investments are the factors fueling the growth of the AI in manufacturing market. In addition, evolving industrial IoT and automation is further supplementing the growth of the AI in manufacturing market. Increasing need for hardware platforms with high computing power to run various AI software is the key factor accelerating the growth for hardware devices in the AI in manufacturing market. Demand for high-computing processors to run AI algorithms continues to surge its growth in the hardware segment. The processor segment consists of MPUs, GPUs, FPGAs, and ASICs. In processors, GPUs are expected to foresee strong growth owing to high parallel computing capabilities, and the same is expected to continue in the coming years. Machine learning’s ability to collect and handle big data and its applications in various manufacturing applications such as predictive analytics and machinery inspection, quality control, and cybersecurity are fueling its growth. Moreover, ML is expected to account for the largest share of the AI in manufacturing market throughout the forecast period. This is attributed to the enormous availability of data, also called big data, and increase in adoption of ML by factories to improve productivity, reduce machine downtime, and reduce operational cost. Extensive use of computer vision and machine learning technology for machinery inspection, installation of Industrial IoTs, and usage of big data in the manufacturing industry are the factors driving the growth of predictive maintenance and machinery inspection in the AI in manufacturing market. The predictive maintenance and machinery inspection is a regular and systematic application of AI, which ensures proper functioning of equipment and reduces its rate of deterioration. The AI technology in predictive maintenance and machinery inspection encompasses regular examination, inspection, lubrication, testing, and adjustments of equipment without prior knowledge of equipment failure. APAC is also considered to have the most number of manufacturing plants in the world. There are a few dark plants in China, where only robots works, and no human is required. AI implementation can make robots smarter, reduce the downtime of machines, and increase the productivity. Hon Hai Precision Industry Co., Ltd (China) replaced 60,000 factory workers by robots in 2016. This high rate of adoption of industrial robots in manufacturing plants is expected to drive the growth of the AI in manufacturing market in APAC. North America is the major contributor in the AI in manufacturing market, wherein the US accounted for the largest share in 2017. Cross-industry participation in the manufacturing domain, along with a significant increase in venture capital investment, has further propelled the growth of the AI in manufacturing market in North America. A few companies in the AI in manufacturing market are NVIDIA (US), Intel (US), IBM (US), Google (US), Microsoft (US), AWS (US), General Vision (US), GE (US), Siemens (Germany), and Mitsubishi Electric (Japan). The market has active participation of start-ups. A few emerging start-ups in the market are AIBrain (US), Ubtech Robotics (China), and Darktrace (UK). Intel is among the market leaders in designing and manufacturing advanced integrated digital technology platforms. The company has robust market presence, especially in the PC and data center market, and invests significantly in R&D, which has resulted in its strong position in the AI market. The company has computing solutions for large complex applications in the cloud to small low-power mobile devices at the edge. In the past 2 years, Intel has significantly demonstrated its strong inorganic growth strategy. The acquisition of companies such as Saffron Technology, Altera, Nervana Systems, Movidius, and Mobileye has further improved its AI product portfolio. As a result, Intel launched a few major products catering to AI, ML, and DL (neural networking). Moreover, a partnership with AI software solution and service providers is expected to remain a vital growth strategy of the company in the coming years. In September 2018, Siemens launched a new service approach for overhead line inspection called "SIEAERO" at European Utility Week 2018 in Vienna, Austria. For the first time, AI and a long-range unmanned aerial vehicle (UAV) are used to inspect transmission lines. SIEAERO smart analytics software utilizes AI and ML to store, manage, and analyze all data in one integrated software system. In September 2018, Shell Global Solutions (US) announced that it is broadening its work with Microsoft to help accelerate industry transformation and innovation. Through this collaboration, Shell will drive efficiencies across the company from drilling and extraction to employee empowerment and collaboration, as well as safety for its retail customers and employees. As part of this deal, Shell announced that it has selected C3 IoT with Microsoft Azure as its AI platform to enable and accelerate digital transformation on a global scale. In March 2018, Siemens and Atos announced the reinforcement of their strategic cooperation, with plans to accelerate their joint business until 2020 through an ambitious joint go-to-market plan and the strengthening of their joint innovation and investment program. The program has been increased by ~USD 107 million (€100 million), totaling ~USD 353 million (€330 million)—more than three times the original sum. Which are the major applications of AI in manufacturing market? How big is the opportunity for their growth in the developing economies in the next 5 years? Which are the major companies in the AI in manufacturing market? What are their major strategies to strengthen their market presence? Which AI technology will find its major application in manufacturing? Which are the leading countries in the AI in manufacturing market? What would be the share of North America and Europe in this market in the next 5 years? What will be the role of the standards and regulations by governments and associations in the adoption of AI in manufacturing? The study involved 4 major activities in estimating the current size of the AI in manufacturing market. Exhaustive secondary research has been conducted to collect information about the market, the peer market, and the parent market. Validating findings, assumptions, and sizing with industry experts across the value chain through primary research has been the next step. Both, top-down and bottom-up approaches have been employed to estimate the complete market size. 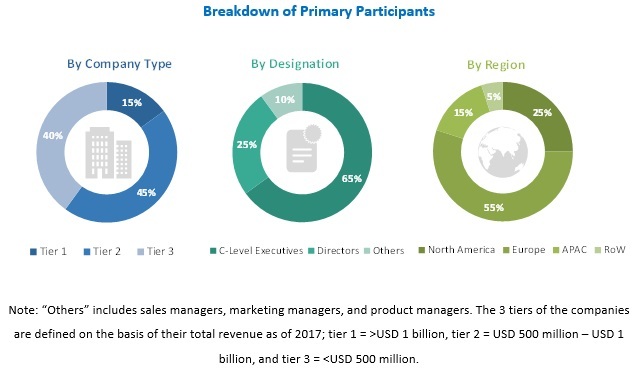 In the subsequent steps, market breakdown and data triangulation methods have been used to estimate the market size of segments and subsegments. The research methodology used to estimate and forecast the AI in manufacturing market begins with capturing data on revenues of the key vendors in the market through secondary research. This study involves the use of extensive secondary sources, directories, and databases such as Hoovers, Bloomberg Businessweek, Factiva, and OneSource to identify and collect information useful for the technical and commercial study of the AI in manufactuing market. Moreover, secondary sources include annual reports, press releases, and investor presentations of companies; white papers, certified publications, and articles from recognized authors; directories; and databases. Secondary research has been mainly done to obtain key information about the industry’s supply chain, the market’s value chain, the total pool of key players, market classification and segmentation according to industry trends, geographic markets, and key developments from both market- and technology-oriented perspectives. In the primary research process, various primary sources from both supply and demand sides were interviewed to obtain the qualitative and quantitative information relevant to AI in manufacturing market. Primary sources from the supply side include experts such as CEOs, vice presidents, marketing directors, technology and innovation directors, application developers, application users, and related executives from various key companies and organizations operating in the ecosystem of the AI in manufacturing market. Value in USD & Volume in thousand units. This report categorizes the AI in manufacturing market based on offering, technology, application, industry, and region.